Easter is right around the corner and what better way to start representing spring then with gorgeous fresh pastels. I bought these wide leg shorts from Asos a while ago and have been waiting to style them. They go great on casual days with a simple tank top, chunky accesories and sandals or as I styled it here for windy days, loafers and a tucked in button up. 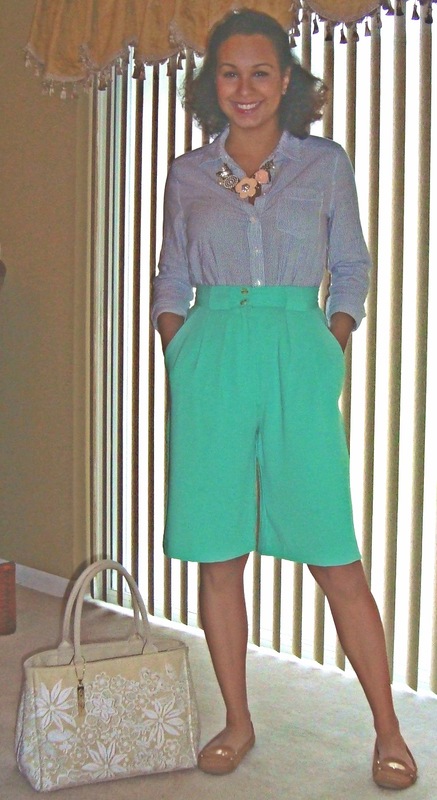 As always they are high waist and the mint color really accentuates any skin tone. My striped button up is from Forever 21 and so is my chunky flower necklace. I purchased my Michael Kors loafers at TJMAXX and the neutral tone goes with anything! Pastels can be paired with both neutrals, or color blocked with other pastels to make for perfect spring time look. Im looking forward to rocking these all spring long!